Reference number for this case: 26-oct-54-LaBadiere. Thank you for including this reference number in any correspondence with me regarding this case. An inhabitant of La Vaureille, commune of Alleyrat, Aimé Bousard, 47-year-old farmer, told first to the mayor, then the gendarmes, that having gone in the evening of October 26, 1954 to the town hall of Alleyrat to get a paper, he left at about 10:30 p.m. on a bicycle. Around 10:45 p.m., he was at a place called "La Badière", when he suddenly saw someone on the roadside. He stopped to see who he was, but still astride his bicycle. He thought it was a man, and when he bent down, he saw that man was getting up suddenly, pointing at him "two powerful lamps projecting a very intense light, of light blue color." According to Mr. Bousard, the being also had a lamp emitting a green light on each side of the head, much weaker than the two previous lights. He was about 1.60 meters tall and was dressed like a diver. When the being got up, Bousard felt "a pressure that I cannot define but comparable to an extremely violent breath that projected me on the other side of the road." He said he stayed about 10 minutes without being able to scream or call for help, while the two lamps were aimed at him. Then, the being crossed the road and disappeared "suddenly without me being able to see the direction he took. I was very afraid. By falling under the effects of lamps, I felt - and I still feel - pain in the leg and right hand." Bousard swore that he had not been drunk, that it was not a hallucination, and that the being he met was not an inhabitant of the country. The gendarmes of Aubusson, who recorded his statement, said that Mr. Bousard actually appeared to be suffering at the two indicated limbs and that he gave the impression of feeling a great deal of pain. His right hand was swollen and he had difficulty writing. The bike showed no signs of falling or collision. On the spot indicated by Bousard, the earth was freshly stirred as by a circular friction of 0.70 meters in diameter, while no footstep marks were visible in the surrounding area. The press reported that the inhabitants of Alleyrat commented on the affair, some firmly believed that Bousard had met an unknown being, perhaps a "Martian", while the vast majority of the people remained somewhat skeptical though Mr. Bousard had the reputation of being a sensible man. In the 1970s, ufologist Jean Giraud investigated the case, and learned from a Gendarme who had taken the testimony of Mr. Bousard at the time, that the latter was known as an unpleasant braggart, and had been thrashed by young people. He then took advantage of the context and the many observations made at the time to invent this story to explain to his advantage the bruises he had. But many later sources ignored the explanation. From where does this being of exceptional capacity come from? Guéret. -- Finally, the Creuse was visited by a flying saucer and a being with a magic capacity. "After having paid a visit to the town hall of Alleyrat in the evening, to get a paper there, he had left the borough towards 10:30 P.M. on bicycle. At approximately 10:45 P.M. he was at the location called "La Badière", when he suddenly saw somebody who was on the side of the road." "I stopped, he said, to see what it was while remaining however seated on my bicycle. I had the impression that I dealt with a man: as I bent down, this one stood up suddenly and directed two powerful lamps at me who were projecting a very intense light, of light blue color. This being also had at each side of the head, a lamp emitting a green light, much weaker than the two preceding ones. Of a size of 1 m 60 approximately, he was dressed like a diver. As he stood up, I felt a pressure which I could not define but comparable with an extremely violent breath which projected me to the other side of the road." "I remained approximately 10 minutes without being able to shout or being able to call for Help. During this time the two lamps which emitted a blue light were directed in my direction. Then the being crossed the road crossed and disappeared suddenly without it being possible for me to see the direction he took. I was very afraid. While falling under the effects of the lamps, I felt – and I still feel – pains in the leg and the right hand." "I affirm that I was not drunk: that it is by no means an hallucination and that this was not an encounter with an inhabitant of the country." The gendarmes who recorded this curious testimony said that Mr. Bousard indeed appears to suffer from the two stated members and that he gives the impression to undergo a rather strong discomfort. His right hand is swollen and he has difficulties to write. The bicycle does not bear any trace of fall or collision. On the spot indicated by the farmer, the ground was freshly stirred up as by a circular friction of 0 m 70 of diameter. No footmark is visible in the surroundings. As one well thinks, this extraordinary fact became the subject of all the comments of the inhabitants of Alleyrat. Some firmly believe in the arrival of an unknown being in this place, which they are not far from calling a "Martian." The large majority however remains somewhat skeptic although Mr. Bousard has the reputation of a sensible man. Guéret. -- A farmer of the village of Vaureille, Mr. Aimé Bousard, 47 years old, told to the gendarmes of Aubusson "the strange encounter" he made Tuesday evening while returning from the village of Alleyrat (the Creuse). "At the locality "La Madière", he said, I saw a form which was moving on the side of the road. I stopped for better observing the individual. The latter, who was bent down, suddenly stood up, directing on me two powerful lamps projecting a very dense light blue light. He also had, on each side of the head, a lamp of light green color which emitted rays much weaker than the others. It appeared 1 m 60 tall and I believed initially that he was dressed of a diving-suit. "Suddenly, under the effect of a pressure comparable to a blow I was thrown on the other side of the road where I remained ten minutes without being able to shout or call for help. The light blue lamps remained directed on me. They died out finally. The being crossed the road and disappeared suddenly. I felt and I still feel pains in the legs at the right hand [sic]." At the place indicated by the farmer, the gendarmes noted that the ground had been freshly stirred up. The grass had been torn off on a surface of 70 centimeters in diameter. No footsteps traces were found. Guéret. -- A farmer of the village of La Vaureille, Mr. Aimé Bousard, 47 years old, told to the gendarmes of Aubusson, the "strange encounter" he it made while returning from the village of Alleyrat (the Creuse). "At the locality "La Madière", he stated, I saw a form moving on the side of the road. I stopped to better observe the individual. The latter, who was bending down, suddenly stood up, directing on me two powerful projectors, lamps projecting a very dense light blue light. He also had, on each side of the head, a light green lamp very dense which emitted rays much weaker than the others. He seemed to be one meter sixty tall and I believed initially that he was dressed of a diving-suit." "Suddenly, under the effect of a pressure comparable to a blow, I was thrown to the other side of the road where I remained ten minutes without being able to shout or call for help. The light blue lamps remained directed on me. I felt and I still feel pains in the legs and in the right hand." At the place indicated by the farmer, the gendarmes noted that the ground had been freshly stirred up. The grass had been torn off on a surface of 70 cm in diameter. No trace of footstep was found. Tarbes. -- A truck-driver of Tarbes, Mr. Vincent Casamajou, who was going in the morning towards 6 o'clock, with a loading in direction of Angoulême, in company of his wife, saw in his rear view mirror, a strange white gleam. Having parked his truck on the low side of the road, he saw, and his wife too, a machine which had just taken off from a meadow, at less than 50 meters. The apparatus, which had the shape of a huge cauldron, rose at a high speed, following a 45° angle. It left behind a white trail, it disappeared in the clouds. Mr. Casamajou and his wife affirmed that this "cauldron" was large like a 5-ton truck and flew without noise. Rome. -- Three employees of the prefecture of police force of Modena made statements about the appearance of a foreign "machine" in the sky of this city. They affirmed that the apparatus after having crossed several kilometers in zigzag stopped just above the airfield while launching flares in all the directions, after that, it reportedly moved away vertiginously towards the Apennines. In Florence, hundreds of people who attended a local training session of the soccer team, as well as the players of this team affirmed that several "unfathomable objects" of an absolute white crossed the sky in formation, moving from the north towards the south. These "objects" included "cigars" and "discs". Another machine, of cylindrical form and a very marked pink color, crossed, according to three witnesses, the sky of Verola at a fast pace, in direction of the North-West. Paris, Oct. 30. 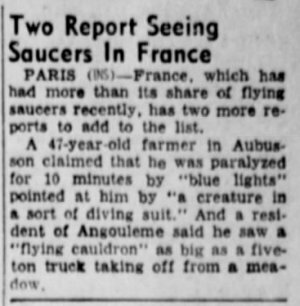 (INS) -- France, which has had more than its share of flying saucers recently, has two more reports to add to the list. 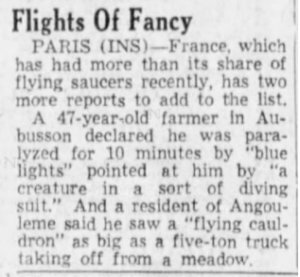 A 47-year-old farmer in Aubusson claimed that he was paralyzed for 10 minutes by "blue lights" pointed at him by "a creature in a sort of diving suit." And a resident of Angouleme said he saw a "flying cauldron" as big as a five-ton truck taking off from a meadow. Paris (INS) -- France, which has had more than its share of flying saucers recently, has two more reports to add to the list. 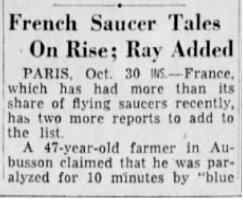 PARIS, Oct. 30 (INS) -- France, which has had more than its share of flying saucers recently, has two more reports to add to the list. 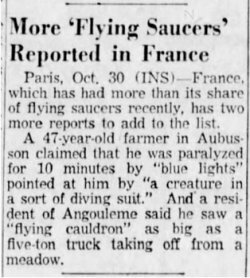 A 47-year-old farmer in Aubusson claimed that he was paralyzed for 10 minutes by "blue lights" pointed at him by "a creature in a sort of diving suit." And a resident of Angouleme said he saw a "flying cauldron" as big as a five-ton truck. Paris, Oct 30. 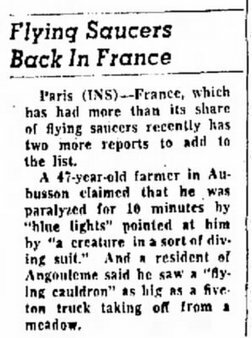 INS -- France, which has had more than its share of flying saucers recently, has two more reports to add to the list. A 47-year-old farmer in Aubusson declared he was paralyzed for 10 minutes by "blue lights" pointed at him by "a creature in a sort of diving suit." And a resident of Angouleme said he saw a "flying cauldron" as big as a five-ton truck taking off from a meadow. Jimmy Guieu indicates that on October 26, 1954, in the Creuse, a farmer of the village of Vaureille, Aimé Boussard, aged 47, saw at the locality "La Madière" near Alleyrat a silhouette which moved on the edge of the road. "I stopped for better observing the individual. The latter, who was lowered, suddenly stood up, directing two powerful 'lamps' projecting very dense light-blue light at me. It also had, at each side of the head, a 'lamp' which emitted much weaker rays than the others. It appeared approximately 1 m 60 tall and wore a kind of diving-suit. Suddenly, under the effect of a pressure comparable to a extremely violent blow of air, I was thrown to the other side of the road where I remained ten minutes, paralyzed without being able to shout or call for help. The light-blue lamps remained directed at me. They died out finally. The being crossed the road and disappeared suddenly. I felt and I still feel pains in the legs and at the right hand." Jimmy Guieu says that the gendarmes found at the place indicated by the witness freshly stirred up ground, that the grass had been torn off on a surface of 70 centimeters in diameter, and that no trace of footstep was found. The author notes that on October 26, 1954 in the evening, Mr. Boussard, in La Madière in the Creuse, saw a diver who appeared to him to be 1.60 meters, but he did not see a saucer. Oct. 26, 1954, evening, La Madiere (France). Aimé Boussard, 47, a farmer, evening was suddenly confronted with an individual of normal height (1.60 m) wearing a sort of diving suit with a pale-green light on either side of the helmet. The individual aimed at the witness the beam of two blue lights, and he was thrown backward. No craft was observed. (92) (Le Parisien, 28 oct. 1954). This ufologist wrote that the story has been explained: farmer André Boussard had seemingly shot at a stranded motorist. 1954/10/26 ALLEYRAT = La Madiere = Vaureille, France: Figure w/lites: /r8 #311. + Bowen: Humanoids. Farmer shoots at stranded motorist! /r30 p670. The witness, Mr. B..., living in "La Vaureille" Cmne d'Alleyrat, was returning on a bicycle from the Mairie of that Commune. At the place called "La Badière", he suddenly saw someone on the side of the road and stopped, straddling his bicycle. This character of about 1 m. 60 was dressed like a diver. On each side of his head was a lamp emitting a green light. This character, sitting, stood up, pointing two powerful lamps projecting an intense light blue light. The witness was thrown abruptly across the road by a pressure like a violent breath. He remained about 10 minutes without being able to scream, feeling pain in his leg and right hand. The being crossed the road and disappeared. The Gendarmes who recorded his statement found that the witness seemed to be suffering at the indicated limbs. His right hand was swollen. The bike showed no signs of falling or collision. At the place where the character had been seen, the earth was freshly stirred as by a rub. IDENTIFICATION: The Witness was known as an unpleasant bragger and had been beaten by young people. Taking advantage of the context and the many observations made at the time, he had invented this story to explain to his advantage the bruises he had. (Inv. GIRAUD to a Gendarme who took this statement at the time). Witness Boussard Aimé, 47, agricultural worker at La Voureille. The witness saw a figure moving along the side of the road. The being stood up and pointed at him two powerful lamps projecting a pale blue light. The witness was thrown across the road where he remained "paralyzed" for 10 minutes. Then the being volatilized on the spot. G.2 p. 204 - H.A.M. 6 - V.c Nr 311 - Centre-Matin for 10/28/1954. A personal counter-investigation made us find out that the witness (a liar, boastful and "unpleasant" individual) was beaten by young men from the country and preferred to invent this story to his advantage to explain his bruising traces. These ufologists date the case on October 26, 1954, as did Jacques Vallée. Mr. Boussard [sic] had the reputation to be a boasting and unpleasant character and had been beaten up by young people. "Benefiting from the context and the many sightings reported at the time, he had invented this story to explain to his advantage the wounds which he had." Invention by the witness. "OVNI" p. 670. A farmer said a figure of normal height dressed in a "diving suit-type" outfit zapped him with two beams of energy knocking him to the ground. If the supposed being had arrived in a saucer, it was not parked where the victim, M. Aime Boussard, could see it. 207. 206. Paris, France. Le Parisien. 28 October 54. 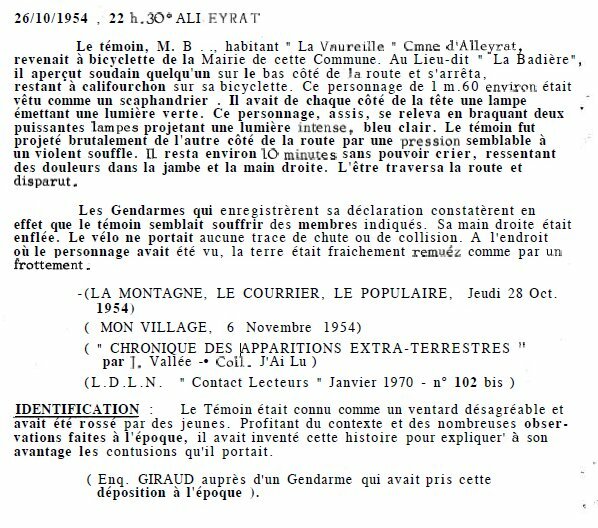 The Belgian ufologist indicates in her catalogue that in 1954, on October 26 in France, in Alleyrat - La Madière, or La Badière, "In the evening Aimé Boussard, farmer, was suddenly in the presence of an individual of normal size (1,60m) covered of a kind of outfit with two pale green lights on each side of the helmet. This individual directed towards him the beam of two blue lights and he was knocked over. No craft was observed." The sources are noted "Le Parisien, 28 oct 1954" and "Jacques Vallée: 'Chronique des apparitions ET' - DENOEL 1972 - COLL. J'AI LU - p. 289". She adds that actually "the witness was known as an unpleasant boaster and was beaten by young people. Benefitting from the context and the many observations made at the time, he had invented this story to explain to his advantage the bruises he had." The source is noted "M. FIGUET/ J.L. RUCHON: 'Ovni, Premier dossier complet...' Alain Lefeuvre pub. 1979, p. 670, 671". Aime Brousard, 47, stopped to look at someone on the footpath. This person, who had been crouching down, rose suddenly and turned upon him 2 very bright pale-blue lamps. At the sides of his helmeted head were 2 weaker light green lamps. The effect of the blue light on Brousard was to fling him to the other side of the road, where he lay paralyzed, unable to call out, for 10 minutes. Then the lamps went out, and the being crossed the road and disappeared from view. Brousard then recovered, but still felt pain in his legs and hands. 1954 - On this evening in La Madiere, Creuse, France Aime Boussard, a 47-year-old farmer, was suddenly confronted by an unusual individual of normal height (1.60 m) wearing a sort of diving suit with a pale green light emitted from either side of the helmet. The being aimed two beams of blue light at the witness, who was thrown backward when struck by the rays. No craft was observed. (Sources: Le Parisien, October 28, 1954; Jacques Vallee, Passport to Magonia: A Century of Landings, p. 238, case 311; Michel Carrouges, Les Apparitions de Martiens, p. 120). In the evening - In La Madière (France), Aimée Boussard (47 years old, farmer) is suddenly in the presence of an individual of normal size 1,60 m, covered of a kind of outfit with 2 pale green lights on each side of the helmet. This individual aims at him a ray of 2 blue lights, and he is thrown back. But no craft is observed. The source is indicated as "Le Parisien, October 28, 1954". Luc Chastan indicates that in the Creuse in Alleyrat on October 26, 1954 at an unknown hour "At the location 'La Madières', a witness saw a silhouette which moved on the roadside. The witness stops for better observing the individual. The latter who was squatted stood up suddenly, aiming at the witness two powerful lamps projecting a very dense blue light. The entity has on each side of the head a lamp of light green color emitting a beam weaker than the others. The being seemed to be 1m60 tall and carried a kind of diving-suit. Suddenly, the witness is thrown as by an extremely violent blow at the other side of the road where he will remain paralyzed 10 minutes without being able to shout. The light blue lamps remained directed at him. It died out and the entity crossed the road and disappeared suddenly. The witness felt during some time pain in the legs and the right hand. At the place he indicated, the gendarmes noted that the ground was freshly stirred up and grass was torn off on a surface of 70 cm in diameter". The source is noted as "Black-out sur les Soucoupes volantes by Guieu Jimmy ** Fleuve Noir 1956 omnium 1977". Aime Boussard (47), a farmer, was suddenly confronted with an individual of normal height (1.6m), wearing a sort of diving suit with a pale green light on either side of the helmet. This individual aimed a beam of blue light at Aime, who was thrown backwards. Vallee Case 311, citing Le Parisien, 28 October 1954. Aime Brousard, 47, stopped to look at someone on the footpath. This person, who had been crouching down, rose suddenly & turned upon him 2 very bright pale-blue lamps. At the sides of his helmeted head were 2 weaker light green lamps. The effect of the blue light on Brousard was to fling him to the other side of the road, where he lay paralyzed, unable to call out, for 10 minutes. Then the lamps went out, and the being crossed the road & disappeared from view. Brousard then recovered, but still felt pain in his legs & hands. 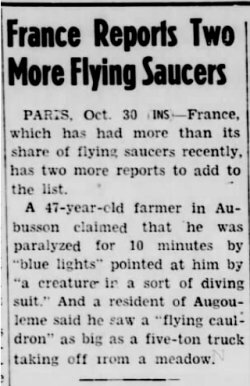 *Oct. 26, 1954 - On this evening in La Madiere, Creuse, France Aime Boussard, a 47-year-old farmer, was suddenly confronted by an unusual individual of normal height (1.60 m) wearing a sort of diving suit with a pale green light emitted from either side of the helmet. The being aimed two beams of blue light at the witness, who was thrown backward when struck by the rays. No craft was observed. (Sources: Le Parisien, October 28, 1954; Jacques Vallee, Passport to Magonia: A Century of Landings, p. 238, case 311; Michel Carrouges, Les Apparitions de Martiens, p. 120). Aimé Boussard, 47, a farmer living in the location "La Vaureille", was returning by bicycle from the town hall of Alleyrat. At the place called "La Badière", he suddenly saw someone on the side of the road, and stopped while astride on his bicycle. The figure was dressed like a diver and was about 1.60 m. He carried on each side of the head a lamp emitting a green light. The seated being pointed two powerful "lamps" projecting an intense light, light blue, when he stood up. The witness was suddenly thrown across the road by a pressure comparable to a violent breath. He remained about 10 minutes without being able to scream, feeling pain in the leg and right hand. The being crossed the road and disappeared. At the place indicated by the witness, the gendarmes found that the earth was freshly stirred. Sources are indicated as La Montagne for 28 October 1954; Le Parisian for October 28, 1954; Jimmy Guieu, "Black-Out sur les Soucoupes Volantes", page 204; Michel Carrouges, "Les Apparitions de Martiens", page 120. Julien Gonzalez indicates that in fact the witness was known to be unpleasant boastful person and had been beaten by young people. Taking advantage of the context and the many observations made at the time, he had invented all this story to explain to his advantage the bruises he wore. The sources for the explanation are indicated as OVNI-INFO, n° spécial "Trois-quarts de siècle d'observations creusoises"; Eric Zurcher, "Les apparitions d'humanoïdes", pages 183-184. This database managed to record this case 17 times! Aime Bousard (47), a farmer, was cycling back from the town hall at Alleyrat to his hamlet Vaureille, when, at a place called Le Madiere or Le Badiere. he suddenly saw an individual bent down by the side of the road. When the stranger stood up he projected two bright beams of blue light on Aime. He also had two lamps, emitting green light, on either side of his head. Aime could see that this stranger was 1.6m tall and dressed like a diver. As he stood up and projected the beams, Aime felt a pressure and a violent wind through him backwards. He remained unable to move for 10 minutes as the stranger moved about, shining the blue beams. He suddenly disappeared. Aime continued to feel pain in his right arm and leg, and when interview the right hand was still swollen. A circle of upturned earth 70cm in diameter was found at the site. Evaluation - According to local gossip Bousard either got into confrontation with a motorist, whom he shot at (meant was hit by?) or got beaten up by a gang of youths and made up the story to explain his injuries. Note: "Gross 1954" is supposed to indicate my web page on the case; but no link is provided and its content is not really reflected, and the presentation by Rogerson might suggest that I did not give the explanation. Rogerson also mixes, like Larry Hatch did, this case with another: Aimé Bousard never "dealt with a motorist on whom he shot." "Explained unless proven otherwise: confusion. No UFO had been reported whatsoever in relation with this event. The case is sometimes also referred to as having taken place in Alleyrat or Vaureille." On November 22, 2004, having been contacted by an historian of the area, and after our discussion and kind offer, I managed to get the article of the newspaper "La Montagne" published seemingly two days after the events [Ref. lm1 above]. The witness is Mr. Bousard whereas Jacques Vallée indicates Mr. Boussard; the locality is "La Badière" whereas Jacques Vallée indicates "La Madière." When I come to think about it, I find it rather odd that Mr. Bousard would have shot on a motorist mistaken for Martian, which is by no means mentioned by the newspaper, whereas it is himself who is wounded when an "extremely violent" breath throws him on the road, where he remains "10 minutes without being able to shout nor to call for help." I figured out that possibly Charles Bowen mixed things up with some other case, maybe that in Sinceny. But more important, the discovery of the misspell "La Madière" instead of "La Badière" by Jacques Vallée helped me find out the explanation by Michel Figuet, [Ref. fr1: above], which was not that of a confused witness but that of a lame made up story. Larry Hatch indicates as source for the "Farmer shoots at stranded motorist" explanation "/r30 p670," that is, Michel Figuet's book on page 670; which really is [Ref. fr1], not a "farmer shoot at motorist" but a hoax. [lm1] Article in the regional newspaper La Montagne, Clermont-Ferrand, France, page 4, October 28, 1954. [le1] Article in the regional newspaper L'Est Républicain, France, page 10, October 28, 1954. [---] Article in the regional newspaper Centre-Matin, France, October 28, 1954. [---] Article in the regional newspaper Le Courrier, France, October 28, 1954. [---] Article in the regional newspaper Le Populaire, France, October 28, 1954. 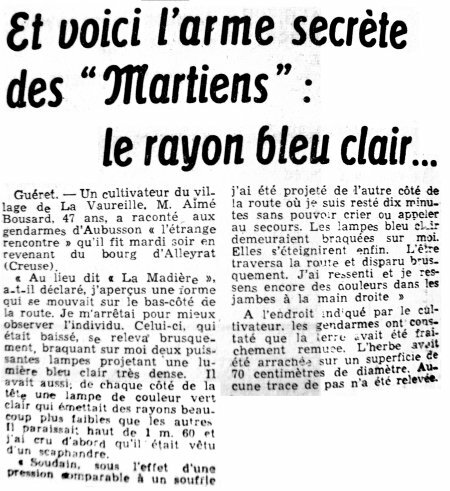 [---] Article in the national newspaper Le Parisien, October 28, 1954. [vm1] Article in the regional newspaper Var-Matin - République, France, October 29, 1954. [tr1] Article in the foreign newspaper The Times Record, Troy, New York, USA, page 1, October 30, 1954. [cp1] Article in the foreign newspaper The Courrier-Post, Camden, New Jersey, USA, page 10, October 30, 1954. [dr1] Article in the foreign newspaper The Daily Reporter, Greenfield, Indiana, USA, page 1, October 30, 1954. [is1] Article in the foreign newspaper The Indianapolis Star, Indianapolis, Indiana, USA, page 12, October 30, 1954. [nj1] Article in the foreign newspaper The News-Journal, Wilmington, Delaware, USA, page 8, October 30, 1954. [ci1] Article in the foreign newspaper The Cincinnati Enquirer, Cincinnati, Ohio, USA, page 2, October 31, 1954..
[dt1] Article in the foreign newspaper The Daily Times, New Philadelphia, Ohio, USA, page 13, November 1, 1954. [---] Article in the local newspaper Mon Village, France, November 6, 1954. [mc1] "Les Apparitions de Martiens", book by "Michel Carrouges", aka Louis Coururier, Fayard publisher, France, page 120, 1963. [cb1] "The Humanoids", book by Charles Bowen, Henry Regnery publisher, Chigaco, 1969. [jv1] "Un Siècle d'Atterrissages", article by Jacques Vallée, in the ufology magazine Lumières Dans la Nuit, France, #43, 1969. [jg1] "Black-Out Sur Les Soucoupes Volantes", book by Jimmy Guieu, Omnium Littéraire publisher, France, pp 231-232, 1972. [---] Ufology magazine Lumières Dans La Nuit (LDLN), France, "Contact Lecteurs" supplement, #102 bis, January 1970. [io1] "Trois-quarts de siècle d'observations creusoises", OVNI-INFO, France, special issue, not dated, the 1970's. [ga1] "La 'Paralysie', article by the G.A.B.R.I.E.L., ufology group, in the ufology and parapsychology magazine Ouranos, France, Nouvelle Série, special issue 1, page 6, 4th quarter 1973. [---] "Les Apparitions d'Humanoïdes", book by Eric Zurcher, Alain Lefeuvre publisher, France, pp 183-184, 1979. [fr1] "Ovni, Premier Dossier Complet des Rencontres Rapprochées en France", book by Michel Figuet and Jean-Louis Ruchon, Alain Lefeuvre publisher, France, pp 670-671, 1979. [mf1] "Catalogue Francat des Rencontres Rapprochées en France - Listing 800", catalogue by Michel Figuet, 1982, France. [lg1] "The Fifth Horseman of the Apocalypse - UFOs: A History - 1954 October", monography by Loren E. Gross, USA, page 85, 1991. [lh1] "A Short List of Discredited UFO Sightings", on the "*U* UFO Database" website, by Larry Hatch, www.larryhatch.net/DISCRED.html, USA, November 2004. [lh1] "A Short List of Discredited UFO Sightings", by Larry Hatch, in The IUFOMRC Newsletter, newsletter of the Roswell UFO Museum, USA, page 4, September 2003. [gz1] "RR3 - Le Dossier des Rencontres du Troisième Type en France", book by Julien Gonzalez, Le Temps Présent publishers, France, pp 441-442, 2014. 1.0 Patrick Gross February 20, 2010 Conversion from HTML to XHTML Strict. First formal version. Additions [mc1], [go1], [dj1], [lc1]. 1.2 Patrick Gross June 7, 2010 Additions [le1], [vm1]. 1.5 Patrick Gross August 14, 2013 Addition [pr2]. 1.6 Patrick Gross October 10, 2014 Addition [ta1]. 1.7 Patrick Gross November 15, 2014 Addition [ni1]. 1.8 Patrick Gross December 2, 2016 Addition [ub1]. 1.9 Patrick Gross December 14, 2016 Addition [lg1]. 2.0 Patrick Gross February 11, 2017 Addition [gz1]. 2.1 Patrick Gross September 19, 2017 Additions [cp1], [dr1], [is1], [nj1], [tr1]. 2.2 Patrick Gross May 3, 2018 Additions [ci1], [dt1]. 2.3 Patrick Gross December 17, 2018 Additions [pr1], [ga1], [io1], [pr2], Summary.